Okay, ladies. It. just. got. real. It’s time to talk about something very real for us, and the best way to solve the symptoms. Finally! A product to help you escape from the symptoms of menopause: Estro-Rhythm: the worlds first single-use, naturally based system for menopause. It Works! Estro-Rhythm uses a superior formula of natural ingredients to help in “getting your rhythm back” and without worrying about all the other synthetic solutions found in most products on the store shelves. Estro-Rhythm helps relieve menopausal symptoms, it’s safe, and effective, and is a simple, easy-to-use system. It is intended for women that are peri-menopausal, menopausal, and post-menopausal. 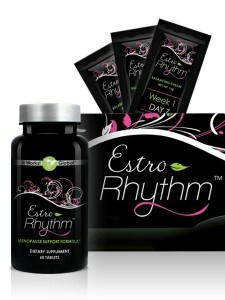 You can start using Estro-Rhythm as early as age 35, when peri-menopause symptoms begin. It comes in convenient pre-measured packs. It includes a supplement and a daily balancing cream application. Just follow the directions and enjoy the relief!